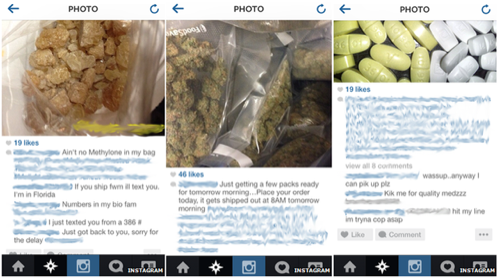 Earlier this week, The Washington Post published a report about people attempting to sell drugs on Instagram illicitly. The photo-sharing platform, which is owned and operated by Facebook, acknowledged the problem and pledged to do more, but its engineers are struggling to control its algorithms, which deliver personalized drug-related media content aimed directly at users who show interest in drugs. Instagram has altered its algorithms and search systems to block users who use the social media platform's hashtags to market opioids and other substances. Recent searches such as #oxy, #percocet, #painkillers, #painpills, #oxycontin, #adderall and #painrelief — revealed thousands of posts by people across America fighting addiction, from rich millennials bragging about their hard-partying lifestyles and advertisements from drug dealers. Eric Feinberg, a researcher and the chief executive of GiPEC, a New York City-based cyber­intelligence start-up that tracks illegal activity on technology platforms, began hunting for drug posts in June by searching for drug hashtags and followed some accounts that were selling drugs. To his amazement, he discovered hundreds of Instagram posts appearing alongside content from 60 major advertisers. 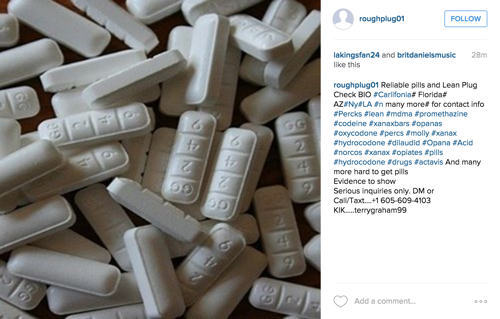 Feinberg then followed the drug dealers' accounts, Instagram’s algorithms instantly started to market drugs directly into his feed, suggesting other drug dealers to follow and introducing him to more drug hashtags. At one point, he told The Washington Post that sellers were about 40% of his feed. However, Monika Bickert, Vice President of Global Policy Management, immediately responded to Feinberg's claims on the Facebook newsroom. She characterized Feinberg’s findings as "misleading" due to this methodology. "An important thing to note is that The Washington Post’s story is based on findings from a research company called GIPEC – findings that we think are misleading. GIPEC created an artificial Instagram feed by following only objectionable content and some brand accounts. And while the fact that they were able to create it in the first place shows we still have work to do, this kind of manufactured feed is not a real representation of what most people see on Instagram," Bickert said. Feinberg said he also saw advertisement pieces from a range of mainstream companies—including Target, Chase and Proctor & Gamble—alongside posts selling illicit drugs. In recent hearings on Capitol Hill, representatives from Facebook and Twitter explained to lawmakers that their engineers were actively suppressing the marketing of drugs on the platform. "We’ve made progress in the fight against illicit drug sales on our platforms, but we have more to do," Bickert said. "We’re committed to making sure we do everything we can to prevent this kind of abuse." Facebook’s vice president for global marketing solutions, Carolyn Everson, told The Washington Post that Facebook and Instagram were in the development stages of artificial-intelligence tools that could flag drug content. She said it was similar to Facebook’s efforts, in 2015, when it built software to detect the Islamic State accounts. Now they are building visual classifiers that can recognize photographs of particular pills and detect common patterns, such as the inclusion of a phone number to move the transaction onto an encrypted messaging platform. 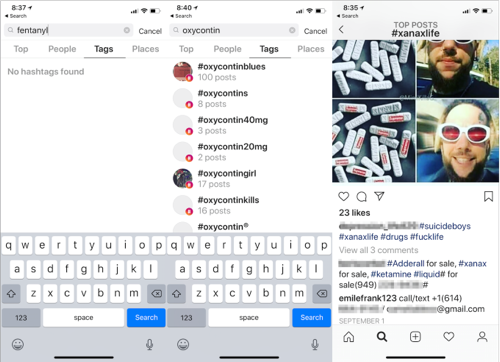 Ultimately, in September, Instagram - which is owned by the world's largest social network - came up with a "solution" by launching a pop-up notification that appears when someone searches hashtags for opioids, prescription medications or illegal drugs. The pop-up instructs people to seek help for drug abuse.